Cadillac is preparing to unveil one the most important models in its comeback tour. The XT4 compact sport utility vehicle making its world debut this week at the New York International Auto Show may not have the flair of the tail-finned Eldorados of the fifties and sixties, or the US$100,000 price tag of today's Escalade. But the vehicle towers in importance as Cadillac's new entry point for young buyers. "It will be leading the charge for us as an interceptor of young affluent buyers – very valuable long-term customers," Cadillac president Johan de Nysschen said. The XT4 has a lot resting on its shoulders as General Motors Co. tries to bring Cadillac back to the upper echelon of luxury. 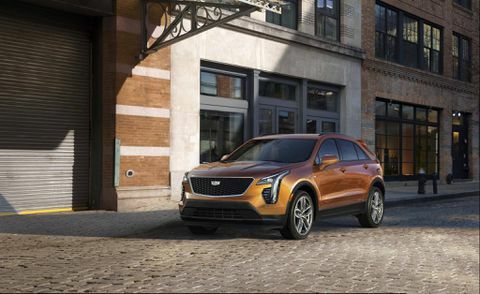 "Cadillac has improved the product, but they have not been able to move the needle on the brand," said Alexander Edwards, president of Strategic Vision Inc., a market research firm. "It hasn't caught on with younger buyers." The XT4 is targeting one of the fastest-growing segments of the market for young drivers – small SUVs. Rivals are also looking to cash in on SUV segments, with Lexus introducing the UX in New York this week and Volkswagen AG showing a five-passenger version of its larger Atlas. Cadillac has put its best effort into the XT4, de Nysschen said. It's the first vehicle designed under Cadillac's new product-development system, and GM now has specific standards for quality, ride and comfort that are unique to the brand. The model will compete with the Audi Q3 but is larger, de Nysschen said. By 2020, Cadillac will try to make up for lost ground with a handful of new models, including a large, prestigious sedan and three crossover SUVs including the XT4. It's part of a US$120-billion push to remake the brand. GM has been trying to remake Cadillac since the late 1990s. The brand had momentum in the early 2000s with the CTS sedan, but financial problems led to budget cuts. Cadillac suffered from a lack of new vehicles, while Lexus and German luxury brands flooded the market with refreshed cars and SUVs. Things only got worse when GM went bankrupt. For several years after, the company spent a lot of its cash feeding brands such as Chevrolet and GMC that were more likely to generate profits, analyst Stephanie Brinley said. Cadillac didn't get a lot of new models, and today it sells only two SUVs: the full-size Escalade and mid-sized XT5.